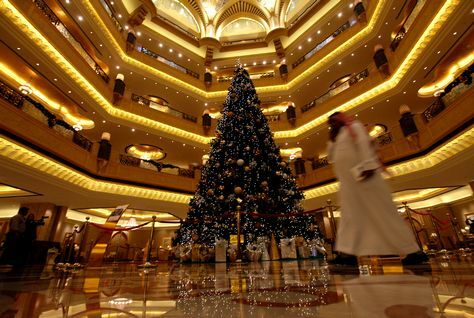 Emirates Palace hotel, the luxury Abu Dhabi hotel, has unveiled what is thought to be the world’s most expensive Christmas tree, valued at more than $11m. The 13-metre fake evergreen tree is located in the hotel’s lobby, and is decorated with silver and gold bows, ball-shaped ornaments and small white lights. However, the record value of the tree is due to the necklaces, earrings and other jewellery draped over its branches. Khalifa Khouri, owner of Style Gallery, which provided the jewellery, said that the tree held 181 diamonds, pearls, emeralds, sapphires and other precious stones. “The tree itself is about $10,000,” said Hans Olbertz, general manager of the Emirates Palace, in comments quoted by AFP. Olbertz added that the hotel planned to contact the Guinness book of world records about the tree, which will remain in its location until the end of the year. The general manager added that he did not believe the tree would offend religious sensibilities. In March, the self-styled ‘seven star’ hotel launched the world’s first gold bar vending machine. The Gold To Go machine, itself covered in 24-carat gold, dispenses one, five and 10 gram bars as well as one ounce bars of gold. Six gold coins of varied weights and engraved with symbols of gold-producing nations Canada, Australia and South Africa, are also dispensed by the machine.